Housetipper.com – Focuses on real estate and home improvement. Certifikid – While only in DC and a few other mid-Atlantic regions, local residents might find some fun and cheap things to do with visiting grandkids on this site. The Living On the Cheap Network also offers a number of local sites that include family entertainment. There’s FloridaKeysonTheCheap.com, for example, for those of you in the sunny southern state. American Express – If you have an American Express card you can sign up for Daily Deals that will be sent to you by way of Twitter. Kostizi – This Deals platform gives you a swipe card so not only do you not have to worry about printing out and stuffing your wallet with all that paper, you can as well retain the unused portion of a Deal for a later return. Facebook Daily Deals Marketplace – The last I heard this Facebook app, with Google mapping, was in 40 U.S. cities. It might have expanded even more by now. 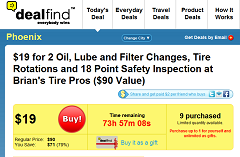 LivingSocial – A huge national Daily Deals site. Google Offers – this is brand new by the search behemoth. While it’s not the only one doing this, Google Offers lets you save the Deal to your smart phone. All you have to do to redeem the coupon is show your phone screen to the merchant. 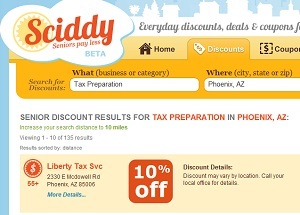 Sciddy.com – This site claims to offer Daily Deals for those of us 50 or older, but it’s really sending you to Groupon where you might find something senior-focused. There are senior-specific discount coupons on Sciddy, however. You can even add a local discount to the site when you hear about one and would like to share it. There are literally hundreds of Daily Deals sites big and small, and local, regional, national and perhaps even global. Do an online search for “Daily Deals Your City” and you’re sure to find a few bargains you can use. Good hunting!